When it comes to a large workspace that is also very high quality, you will find it hard to beat the incredible Hartwood 12′ x 8′ FSC Heavy Duty Workshop. With its awe inspiring size this is a workshop that offers so much space that you will be able to easily fit in multiple workbenches, tools, shelving and anything else that you may need to have fun working on a variety of different projects. 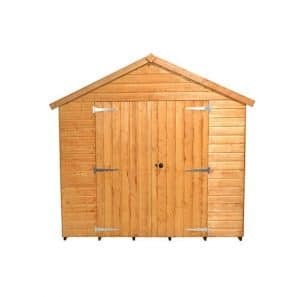 The vast size means that it would also serve you well as a large storage shed. Even though this is strong, heavy duty workshop it is still one very attractive looking structure which is going to be something you are proud to have in your garden. This is one of the strongest and most impressively made workshops that you can get. 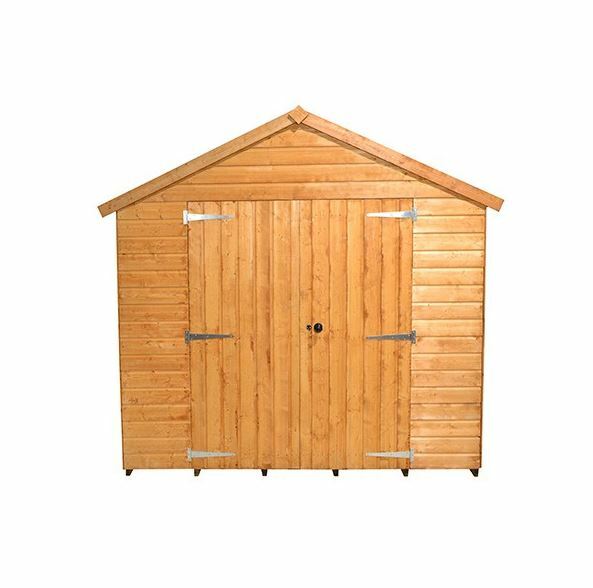 The tongue and groove shiplap cladding will not allow any water or wind inside and is backed up with a robust 45 mm x 45 mm frame that makes the whole workshop be incredibly strong and long lasting. The flooring is made with thick, tongue and groove boards which are sitting on some strong floor joists so you can place many heavy items inside of here without worrying if the floor is able to take the weight. Let us start right away by telling you that the Hartwood 12′ x 8′ FSC Heavy Duty Workshop is the real deal. 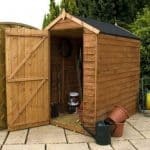 By this we mean that this is an actual heavy duty workshop that is designed for people who love to tackle some projects and need a space that can take a bit of abuse. 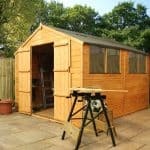 This is one very well made workshop that is offering you plenty of space. 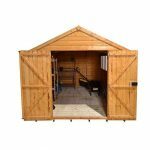 The depth of the workshop is 12 feet 1 inch and the width 8 feet 10 inches so you could actually even use this as a general storage space as it offers so much space. Along the ridge, the workshop stands at a very impressive 8 feet high so you will not only be able to walk around without hunching over, it also means you can work on some taller projects in here as well. The apex roof is made from solid sheet boarding which is then covered with green mineral felt and to be honest with you this is the perfect kind of roof for a structure like this. First of all the apex nature of it keeps the rain off it, but also the materials used are strong, but they are also very cost effective. 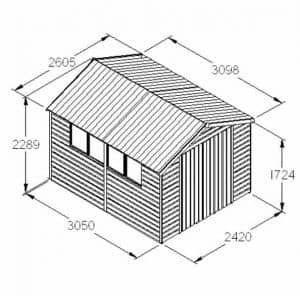 We have seen a few other workshops of this size used overlap cladding and that is fine, but this one here is going that extra mile to make sure it is a step above the rest and this starts with the 12 mm thick, watertight tongue and groove shiplap cladding that they have used. 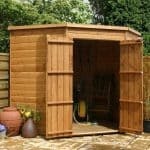 We know that when you have a workspace it is what is happening inside that counts, but this one here gives you the added bonus of being a very attractive feature in your garden and the cladding they have used is the reason for this. The framing inside the workshop is really what makes this a heavy duty structure. They have used an incredible 45 mm x 45 mm frame that is thick and solid. We really love this frame as it is one of the strongest we have seen and it really does help make this feel like a strong and long lasting workshop. You will not have any worries about the wind making this become weak or flimsy. It is not just the cladding and the frame that are strong and high quality. The floor is just as impressive as it is made from tongue and groove boards that are sitting on top of a set of strong floor joists. This kind of floor means that you can really load the workshop up with all kinds of heavy items like tools and workbenches. It is able to take just an amazing amount of weight and it is going to feel great and strong as you are walking on it. 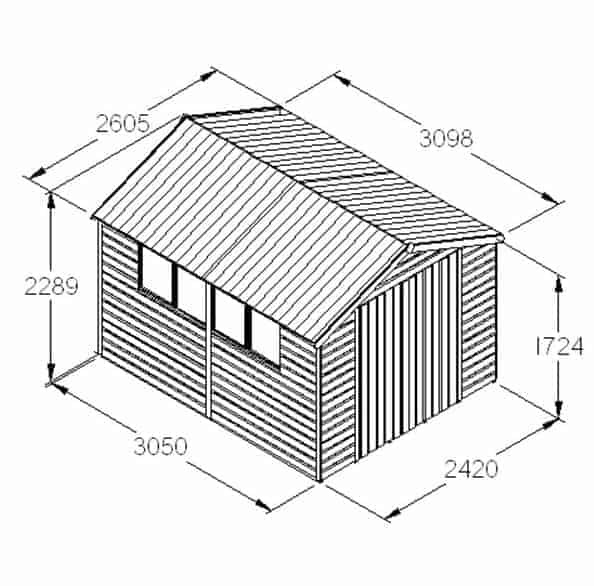 The Hartwood 12′ x 8′ FSC Heavy Duty Workshop is not pressure treated so you will have to roll the sleeves up and give it a coating of treatment. This is best done shortly after construction and then you will need to do it on a once a year basis. As long as you do this then rot is never going to be an issue. They are giving you a ten year anti rot guarantee with this workshop, but it is only valid as long as you are treating the workshop properly. With how amazing the rest of the workshop is, you are not going to be surprised to hear that the doors are just as impressive as the rest of it. These are double doors that are kept in place with three heavy duty hinges which is awesome as most other workshops and sheds will use just two. To really make sure that these doors are extra strong a set of ‘z’ frames have been used on each door. Six fixed polycarbonate windows are on one side of the workshop so plenty of light is going to get inside. While it would be nice if one of these could have opened, we are willing to overlook this as the rest of the workshop is so well made. Also if it does get a bit too hot when you are working hard then you could always just crack open those two large doors. A rim lock is included so once you have finished working inside here, you are able to make sure everything is safely locked up. We feel that this is one of the strongest and most secure workshops you can purchase and have no concerns over the security it provides at all. While there are plenty of windows on one side of the workshop, you still do not have a major lack of privacy with this. The windows could be easily covered up with curtains or you could install the workshop so that the windows are facing away from people who are a little on the nosey side. 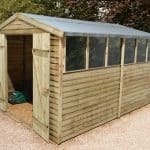 This is so large that it is going to really stand out in your garden so we suggest that you have a long hard think about what colour of wood treatment you are going to use. There are many colours to choose from so do not be scared about getting a little bit creative with how you paint the workshop. 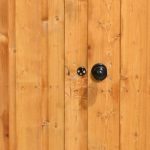 While we love the rim lock that they have put on the doors, they do have a couple of ways that you can kick your security up a notch. The first of these is a hasp and padlock set that is being sold for £19.99, which considering it is a Yale branded one is a fair price. They also have an electronic alarm kit that you can add to the workshop for £29.99. 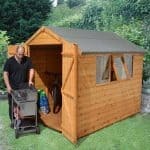 The last extra they have is a plastic shed base, which does cost an expensive £239.99 and is not something we would really think anyone will need, but it is there if you do have worries or even a couple of concerns over the ground you will be installing the workshop on. High quality is what this workshop is all about and any complaints we do have are actually very minor. We really are very impressed with this workshop and feel that it is one of the best ones on the market right now. 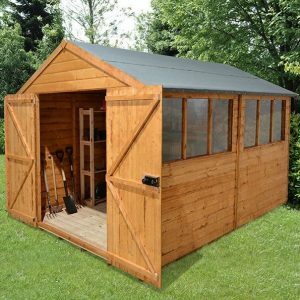 This is one very strong workshop and as long as you keep that cladding rot free, we can see you enjoying this workshop for well over 20 years. You have a whole lot of floor space to play with here, plus the headroom it offers is also very impressive. This kind of space means that you really do not have to make any sacrifices when it comes to the way you lay things out. Of course with this being a large workshop, you will want to make sure you have a person to help you install it. It will take around 6-8 hours, but as long as you follow the instructions and try not to rush it, you will have no trouble at all. 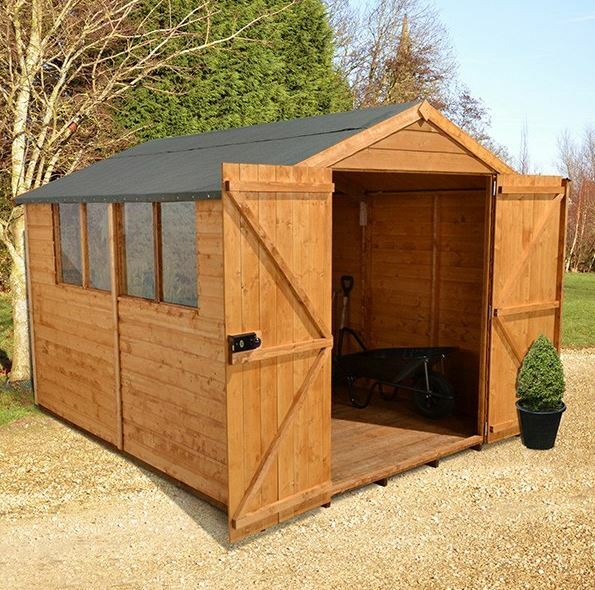 This is certainly what we would class as a premium workshop, but we feel that the price they are asking is very fair as it is made with impressive materials all throughout. 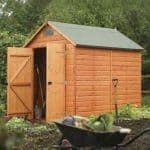 Final Thoughts: We are actually quite blown away with the Hartwood 12' x 8' FSC Heavy Duty Workshop. We know that the price is not cheap, but in this case we feel this is well worth the money as it is high quality in every regard, plus you have a whole lot of space to make use of. The look of the workshop is also great so it really is one of the most complete and impressive workshops we have seen. If you want the best of the best when it comes to workshops then this right here is certainly one of the best and is something that is very easy for us to recommend and do so with a big smile on our face.